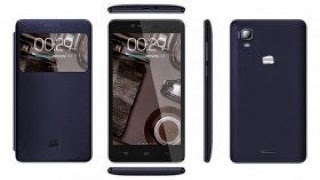 Just recently, Micromax has launched its Doodle 3 phablet. The company has launched ‘Canvas Doodle 3’ in the market at price of Rs 8,500. It will be available via retail outlets that starting from April 25. With not-so-impressive specification sheet, the device is probably having a large screen experience to budget users. While the Doodle 2 was having with a 5.7-inch display, the Doodle 3 is having a slightly large 6-inch FWVGA display. The device runs on the latest Android 4.2.2 Jelly Bean. Under the hood, it’s powered by a 1.3GHz dual-core processor having 512MB RAM. The device is having a 2500mAh battery that promises time upto 9 hours of talk time. If we talk about camera, one can expect a 5-megapixel rear camera with led flash and 0.3-megapixel front facing camera. The connectivity options will include Bluetooth, Wi-Fi and GPS, but there is any no word on 3G. The 4GB internal storage is expandable up to 32GB via microSD card. Commenting on the launch, ‘Shubhodip Pal’, CMO Micromax said, “The Canvas Doodle 3 further re-inforces our commitment to empower consumers with larger screen to help them express their imagination in the more creative way like never before”. 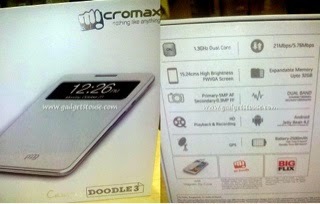 Micromax Doodle 3 india price is ₹8500.